Configuring a new hardware raid on a HP server can be done comfortably from the Linux command line without restarting the server. HP provides a small command line tool for this job. The following shows how this tool can be used to create a new raid. HP’s utility is called “hpacucli” which stands for the “HP Command Line Array Configuration Utility”. The man page is very short and refers to a text file at /opt/compaq/hpacucli/bld/hpacucli-VERSION.noarch.txt for documentation. This document simply does not exist. The man page fails to state that the “VERSION” in the file name need to be replaced with the version of the utility. In this directory a file matching this description exists. The file /opt/compaq/hpacucli/bld/hpacucli-9.40-12.0.x86_64.txt fitting the description does not contain any helpful information either. Instead, the help command needs to be executed step by step to go through the documentation. To address a specific controller to create the raid, the controller “slot” needs to be determined. This can be done using the following command. This command will address “all” controllers and show their status. The result is a list of controllers and their “slot”. To list the physical drives connected to the controller, the command below will address the controller at “slot 1” and show “all” connected physical drives (“physicaldrive”). The output also shows the unassigned drives, as well as the drives assigned to a raid configuration. The documentation shown with “$ hpacucli help create” will assist in the creation of the RAID using the 3 unassigned disks. The RAID I will create on those disks will be a RAID 5. The command contains as usual the command “controller” and the slot of the controller. The command “create” will instruct hpacucli to create a new raid. The create command needs additional parameters. The drives which need to be passed as a list of drives. This can either be a list in the format “[box]:[bay],[box]:[bay],…” or “drives=allunassigned” which takes all unassigned disks for the raid to be created. The raid level to create. 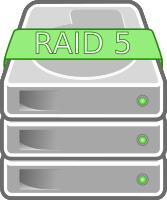 The possible raid levels depends on the number of disks as the different raid levels need a different minimum number of disks. The size of the logical drive to be created. The size is in MB but it is also possible to specify it as “max” which will use the maximum size possible for the raid type and the drives used. With the 3 unassigned drives, a RAID 5 with their full capacity can be created with one of the following commands. The first one addresses all unassigned drives while the second one is addressing them directly but the result will be the same. To verify the new raid, the configuration can be shown with the following command. As the output shows the RAID 5 has been created with the full size of the 3 drives. As RAID 5 loses the capacity of one disc in the logical drive size, the result of 3 drives with 1 TB results in a logical drive with 2 TB capacity. As disk manufacturers specify the drive size in TB while most operating system calculate in TiB. This means that 1 TB is calculated by the decimal “1.000.000.000.000 bytes” while TiB as the operating system is calculating it is calculated binary by 1024 and contains “1.099.511.627.776 bytes”. See Wikipedia Tebibyte for more details. The 2 TB logical drive is only 1,8 TiB as the raid controller shows. To verify that the new logical drive was detected by Linux, execute the following command. fdisk will list (-l option) all drives detected in the system. I have removed some of the drives fdisk detects from the print out to reduce the output to what is important. The output shows the 2000 GB disk which represents the 2 TB logical drive. The logical disk is now ready to be used. Keep in mind that this logical disc when it is created does not even have a partition table on it. Some partitioning tools might show an error or warning about the disc until you have created a partition table on it. With parted(8) and the “mklabel” command, a partition table can be created. This entry was posted in Linux Administration and tagged cli, command line, HP, raid, RAID5, smart array. Bookmark the permalink.